I do not have family members who were in the service, but my family uses Memorial Day weekend as an opportunity to remember everyone we have lost, including those who have served our country. 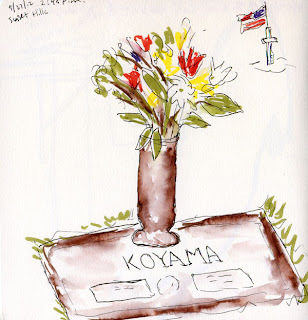 This was sketched at Sunset Hills Memorial Park, where my parents and sister are interred, as well as other relatives. I was almost four years old when my family went to Century 21, the Seattle World’s Fair, in 1962. I remember very little about that Fair – only a yellow plastic lei I received at the Hawaii pavilion (I guess?) and a plastic pen shaped like the Space Needle. I don’t remember seeing the actual Space Needle at all, though I’m sure I must have. 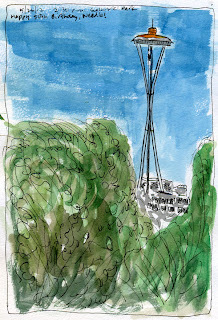 The Space Needle is celebrating its 50th birthday this year, so here’s my birthday portrait, sketched from Gasworks Park. This is Towan, the “big boss” orangutan at Woodland Park Zoo. He seemed lethargic at first, but eventually began to perk up a bit and even seemed to take notice that I was sketching him. 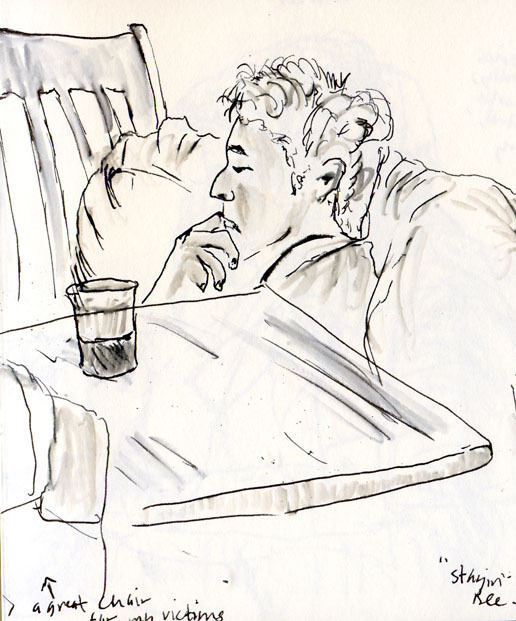 He made eye contact with me many times and moved closer to the corner where I was sketching. 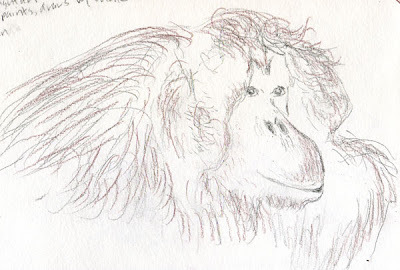 I was told by a man who was also observing the 44-year-old orangutan that Towan is sometimes given chalk or markers to draw with. I like to think that Towan and I bonded briefly over our common penchant for sketching. “It’s like crack!” exclaimed Lisa, describing how she feels after the 6 a.m. Jazzercise class we both attend. “That rush keeps me going the rest of the morning,” she said. I have been going to Jazzercise classes three times a week for 13 years. I work hard, I sweat hard, keeping my pulse rate at the optimal aerobic level for at least 30 minutes, followed by a strength routine and stretching. Yet I have never, ever experienced the endorphin high that Lisa and my runner friends describe. Now I realize I’ve been trying to get high all these years from the wrong drug. Sketching is the real crack! After spending a couple hours at a coffee shop sketching other patrons, I drive home with a buzz that lasts the rest of the day (no, it’s not caffeine – I usually drink decaf). 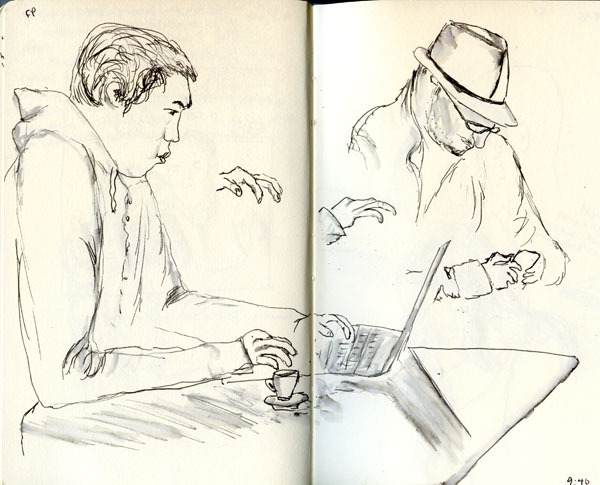 This buzz may be partly due to the surreptitious nature of sketching people without their consent and constantly being alert to avoid being caught. It could be adrenalin as much as endorphins. 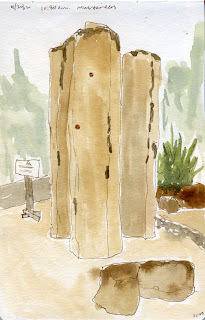 But I get the same rush while focusing on a water tower for an hour, painting the struts and girders with watercolors, or while trying to capture the texture of the skin of a Komodo dragon eyeing me from its enclosure at the zoo. As a fiber artist working slowly and steadily with needle and thread, I know well the calming, meditative quality of placing tiny stitches, one after the other, thousands of times. There’s no doubt that I enjoy that feeling also. But baby, it ain’t crack. And I’m always looking for the next fix. Urban Sketchers’ Manifesto No. 6: We support each other and draw together. 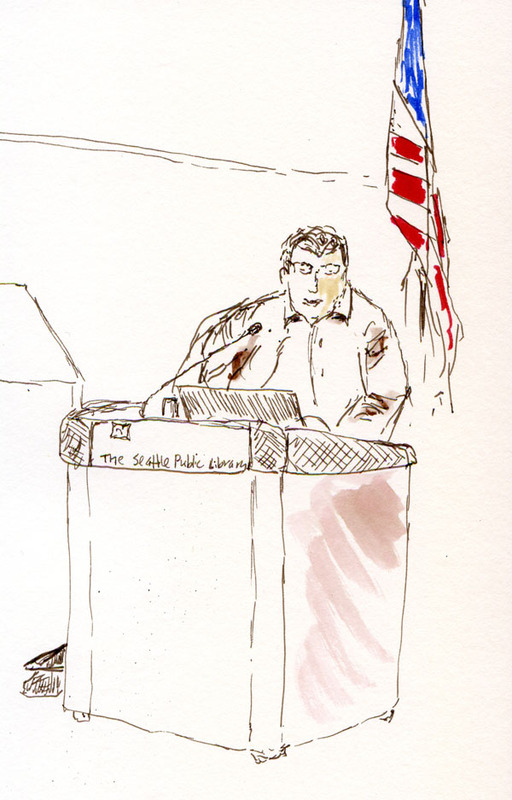 On a rainy Sunday morning – the kind that would usually see me in my recliner with a second cup of coffee and the Seattle Times’ funnies – I drove out to Magnuson Park to join the Seattle Urban Sketchers at my first sketchcrawl. Introvert that I am, going alone to a social event like this – where I wouldn’t know anyone and I wasn’t sure what it would be like – is usually hard for me. The rain, the coffee and the recliner were all telling me I should skip this and go another time. 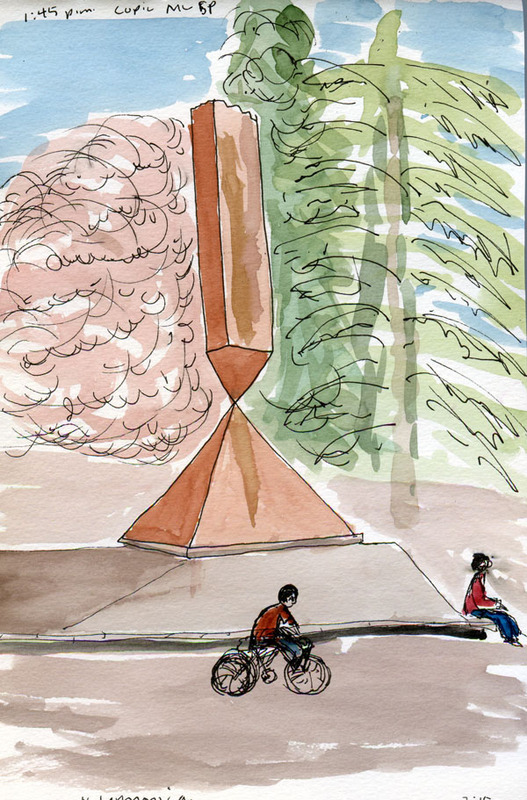 But two things pushed me out the door: One was the Seattle Times’ full-page spreads that very morning of Gabi Campanario’s vibrant sketches of the new Chihuly Garden and Glass exhibition. Talk about inspiring! The second was the commitment I had made to myself to give this sketchcrawl thing a try. It’s part of becoming an urban sketcher and getting out into the world – and really seeing the world. So I did – and I discovered that if there’s such a thing as an introvert’s ideal social gathering, this would be it. I met and chatted with nice people – but only for a few minutes. Then we all went our separate ways to fill a sketchbook page or three. A couple hours later we reconvened and spread our sketchbooks out on a table to share. This time, chatting was much easier because we were admiring and commenting on each other’s sketches instead of making small talk. Our amazingly varied views of Magnuson Park, including my own, enabled me to see this tiny part of the world in a way that I never had before. And I was already looking forward to participating in more sketchcrawls. 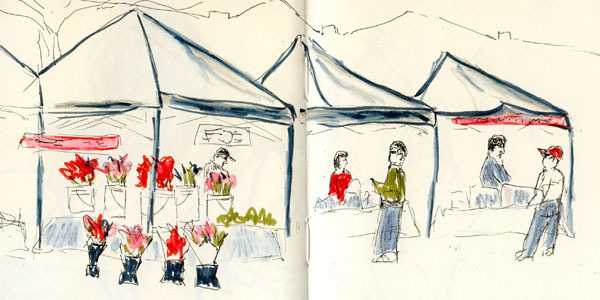 Urban Sketchers’ Manifesto Nos. 2 and 3: Our drawings tell the story of our surroundings, the places we live and where we travel. Our drawings are a record of time and place. 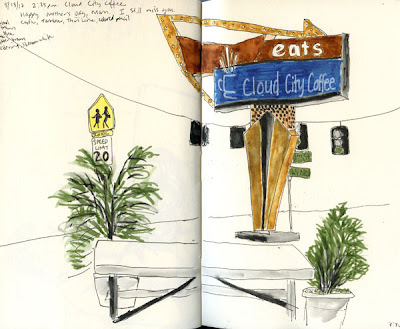 With a sense of urgency, I went back to Cloud City Coffee, this time with a mission: To sketch the Maple Leaf water tower behind its sign. Even though I’ve lived in the Maple Leaf neighborhood for nearly 25 years and have seen the tower nearly every day, it was the first time I closely examined the crisscrossed girders around it or the repeating pattern of the maple leaf motif. 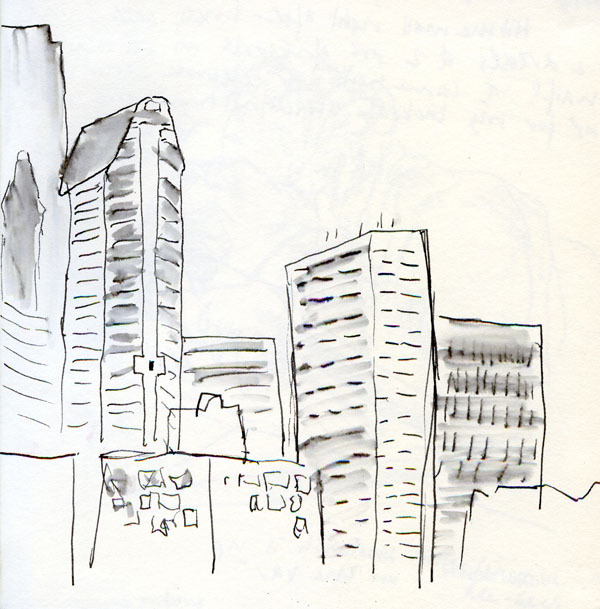 ﻿﻿﻿﻿﻿﻿﻿﻿﻿﻿Urban Sketchers’ Manifesto No. 2: Our drawings tell the story of our surroundings, the places we live and where we travel. On another warm, sunny afternoon, I walked over to Cloud City Coffee, one of my favorite neighborhood coffee spots (and kind of the inspiration for my blog’s name), and sat down at a shady outdoor table. I love the funky, art deco sign. Just beyond the sign is the venerable Maple Leaf water tower, no longer used for its intended purpose, but much loved as a neighborhood icon. 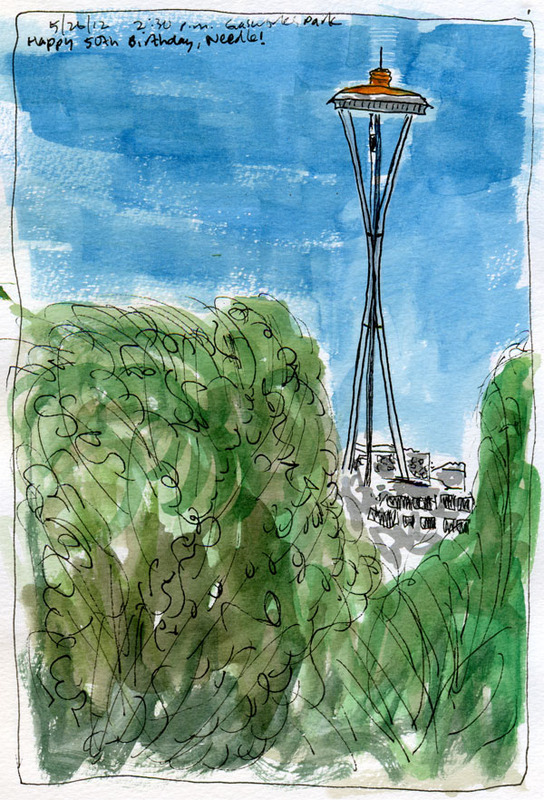 Sketching the sign, I suddenly remembered that the tower is destined to be taken down. I almost put it into this sketch, but decided it deserves a sketch of its own. I felt alarmed: I have to get back there again sometime soon to sketch it before it’s gone. Compelled to snap a quick picture with my phone, I stopped myself. Taking a photo with my phone is a good way to preserve a monument in my phone. Sketching is a good way to preserve a monument in my memory. Urban Sketchers’ Manifesto No. 2: Our drawings tell the story of our surroundings, the places we live and where we travel. I was wandering around the University of Washington campus on a fabulous sunny day – the kind that Seattleites are willing to wait 10 months of overcast skies for. I’ve visited the campus many times since I graduated (for the second time) in 1981, but on this visit it seemed like everything was different. Several new buildings had gone up since my last visit (PACCAR Hall? What’s that? ), and pathways appeared where there used to be grass. A visitor stopped to ask me where the HUB was, the student union building where I had eaten many, many meals over the course of six years, and I had to twirl around to get my bearings before I could point him in the right direction – that’s how disoriented I felt. It’s hard to be nostalgic about one’s youth when everything looks different. 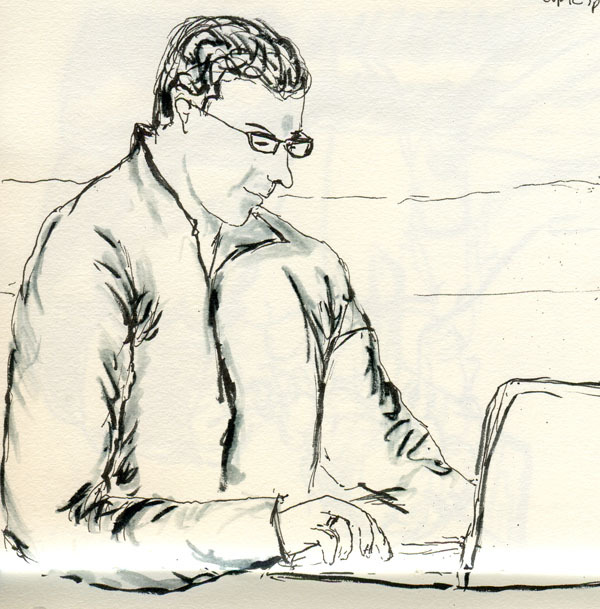 Urban Sketchers’ Manifesto No. 7: We share our drawings online. When I first became aware of urban sketchers posting their drawings on blogs, Flickr and other online communities, my reaction was twofold: inspiration (Wow! I want to do that!) and intimidation (Whoa, I could never do that.). 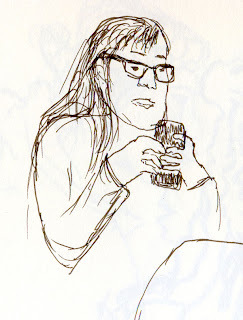 That being both the ability to draw at a certain perceived skill level and the courage to post drawings online. 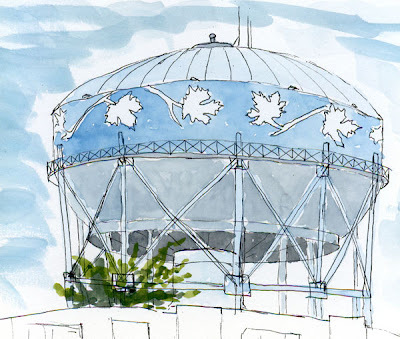 Although, in general, urban sketchers seem to have a wide variety of backgrounds, I noticed that many are professional architects, and their drawings make that clear. Nothing is quite so impressive as a building rendered with perfect perspective. I integrated my two reactions and said to myself, Well, I’ll probably never be able to draw like that, but maybe I’ll practice, and if I ever get that good, I’ll start posting my drawings online. As I continued my daily drawing practice for a few months, I started seeing improvement. Not a lot, but enough to convince me that practicing makes a difference. I would skim through the sketches I had done, see the ones that I was pleased with as well as the ones that were lame, and felt frustrated that my progress wasn’t continual. It was around that time that I had an insight about the sketches I had been seeing online: I’ll bet most people are posting only the drawings they are pleased with and leaving the lame ones in the privacy of their closed sketchbooks! A-ha! Whether or not my insight was correct, it was the secret to eliminating intimidation and viewing the sketches of others for inspiration only. I want to do that! And I’m going to! That’s when I began posting my own sketches online. 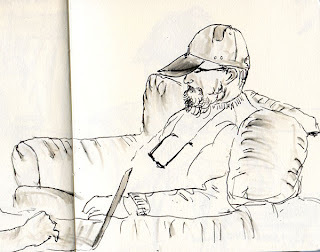 I started with forums like the Sketching Forum and Wet Canvas, where I felt that I could tiptoe quietly, and maybe not many people would see me. That turned out to be safe. 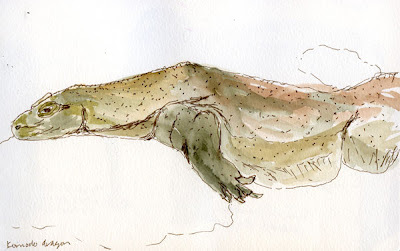 A short time later I began this blog and vowed that I would publish sketches I’m pleased with as well as ones that I think are lame – without necessarily identifying which is which. Still safe! So maybe posting sketches online isn’t so dangerous after all. Yesterday I posted my first sketches to the Seattle UrbanSketchers Flickr group. I see my own drawings right there next to everyone else’s. I want to do that, and I am. As mentioned in the previous post, the Tombow colorless blender has the purpose of blending smoother transitions between solid areas of color and eliminating the streaky “marker” look. Although I haven’t been using the blender pen this way, I’ve been experimenting with using it as a wash mechanism instead of water with some interesting results. With water in a waterbrush – my usual wash tool with water-soluble brush pens – the flow of water can be unpredictable (although with practice, it’s easier to control), so I’ve sometimes lost the original line when too much water was applied. The firm tip on the Tombow marker makes it much easier to apply varying degrees of wash for shading, so the original line can be retained. I wouldn’t use it exclusively, since that firm, dry tip won’t give me an organic, gradient wash that is possible with water and brush. But sometimes I like the finer control that the Tombow blender enables. I’m not sure what the Tombow colorless blender contains besides water, but it does slightly change the hue of the ink being washed. 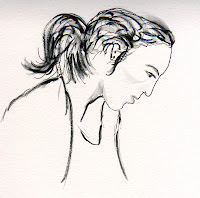 For example, the ponytailed woman (who, unfortunately, left before I could finish her) was sketched with a black Akashiya Thin Line brush pen and washed with water. 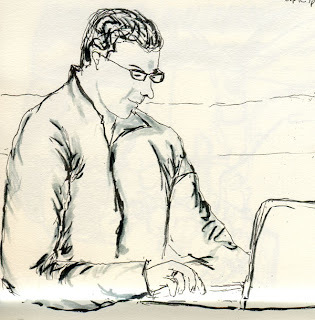 I used the same Akashiya Thin Line to sketch this man working on his laptop, but I used the Tombow blender for shading. I hope you can see it in the scan, but the wash has a slightly bluish cast compared to the water-only wash.
Urban Sketchers’ Manifesto No. 5: We use any kind of media and cherish our individual styles. 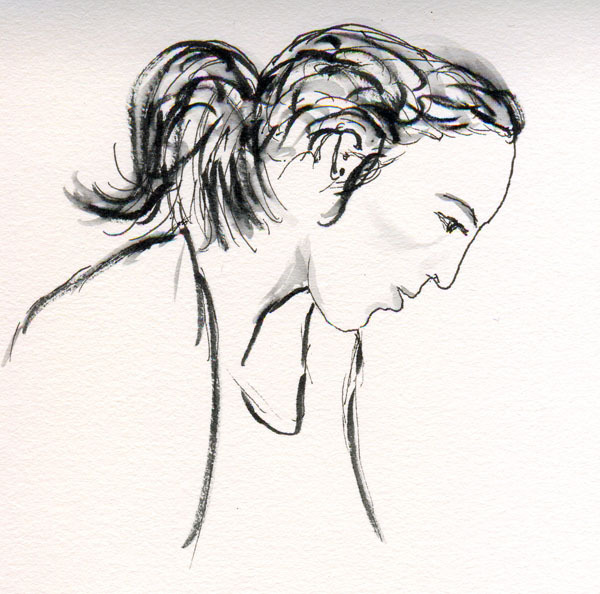 My current favorite grab-and-go sketching medium is water-soluble brush pens used with a waterbrush for light washes. The Tombow brand of brush markers includes a colorless blender, which has the purpose of blending smoother transitions between colors and eliminating the streaky “marker” look. I’ve also lately been experimenting with an old Mont Blanc fountain pen that I used briefly decades ago as a writing pen but never really warmed to. 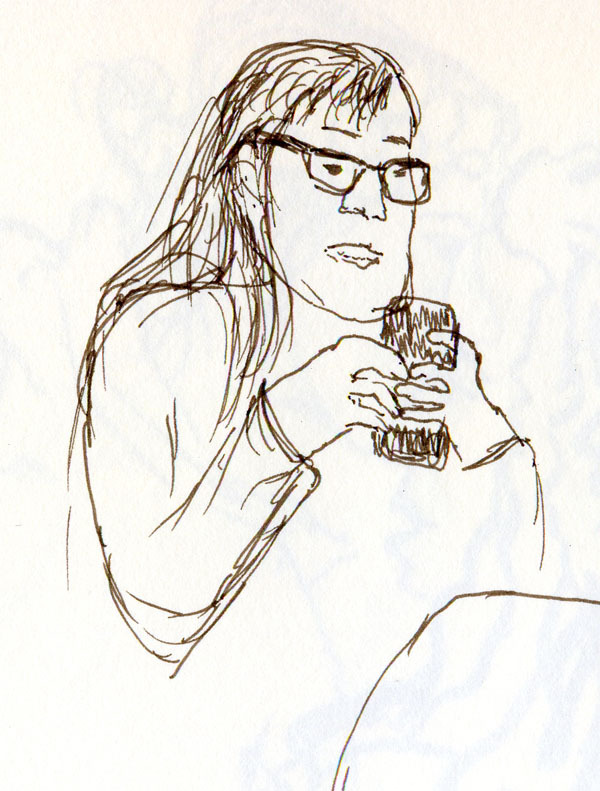 As a sketching pen, I like it much better, so I took it out one day at a coffee shop. Giving water-soluble fountain pen ink a wash with water is a popular sketching technique, so I started wondering what would happen if I used the Tombow blender instead of water. Since the blender pen is not as wet as a brush with water, I can’t get the elegant feathery washes that are (usually accidentally) possible with water. But conversely, the solid Tombow marker tip makes it possible to control the wash to a finer degree, which makes shading easier to control. 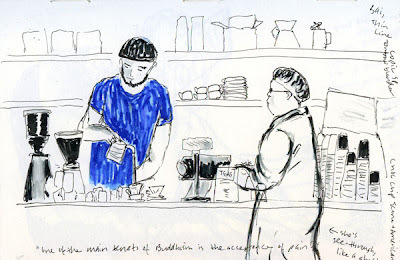 Urban Sketchers’ Manifesto No. 1: We draw on location, indoors or out, capturing what we see from direct observation. 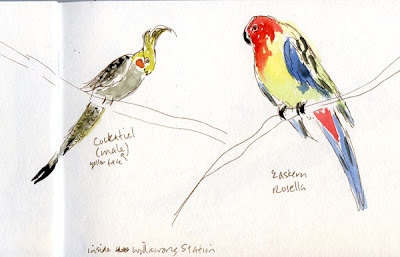 Some of the most marvelous nature sketchers (Elva Paulson springs to mind) are bird watchers who get up before dawn so they can hike to the ideal location to view a particular species, and sketch through binoculars. Of course, birds move fast, so sketching them from direct observation must often be an exercise in frustration. That sounds like too much work to me, so I go to Willawong Station at the Woodland Park Zoo, where more than 150 colorful parakeets, cockatiels and rosellas fly freely inside a large aviary. 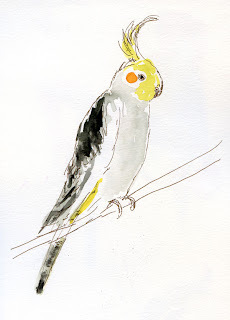 Presumably, they are moving at the same speed they would be if they were in their natural habitat, but because so many of them are concentrated in the same space, I can begin to draw one, and if it flies away, another that looks very similar will take its place as my model. ﻿﻿﻿﻿﻿﻿﻿﻿From direct observation is the operative phrase here. It’s tempting to capture a person or scene first with a photograph, then sketch from the photo leisurely in the comfort of my studio. 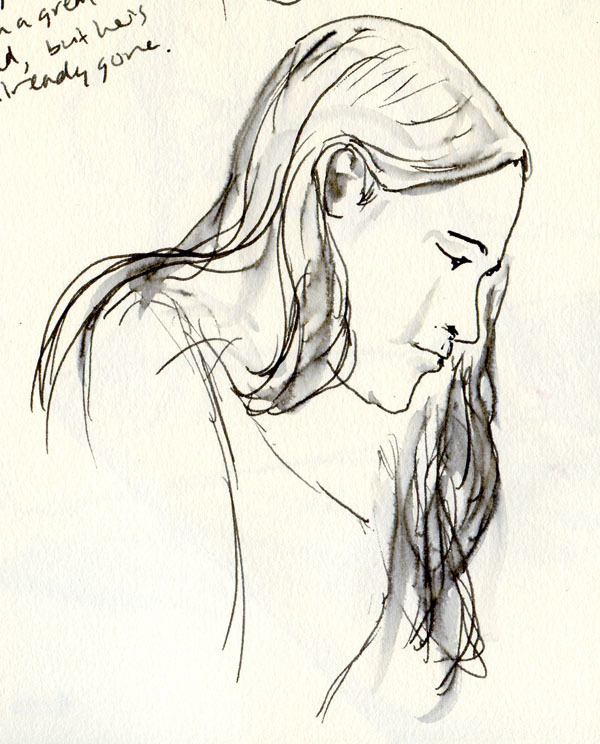 I sometimes do this when I want to practice a technique or medium that would be difficult to use on location, or when the person I want to draw is no longer living. But it always feels like cheating, and frankly, it also feels dull. When I sketch from life, it never feels that way. ﻿﻿This senior gentleman didn’t particularly catch my eye. He just happened to sit directly across from me in the doctor’s office waiting room, so he was an easy target. 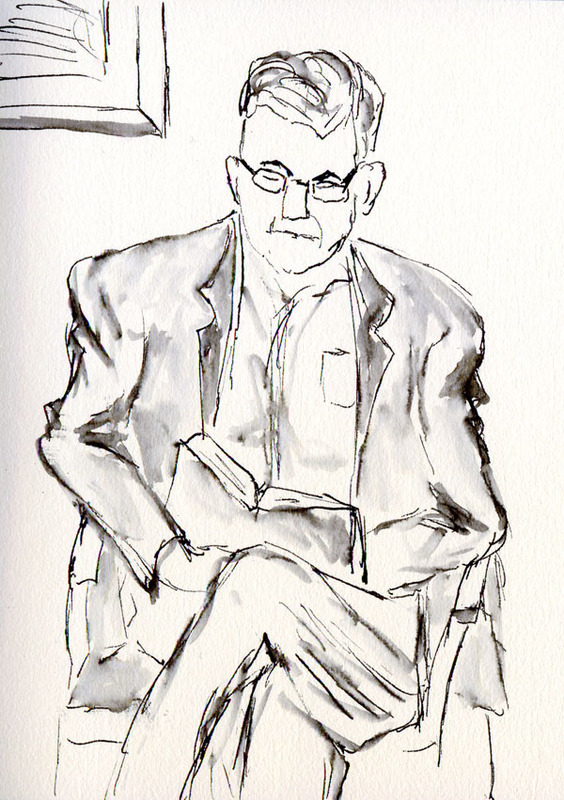 Engrossed in his book, he hardly moved at all – an ideal model. In the 10 or so minutes I took to sketch him, I started thinking about what kind of man wears a suit to a medical appointment, and then I became curious about the thick, hardbound book he was reading. So much of life doesn’t seem interesting until I start to sketch it. 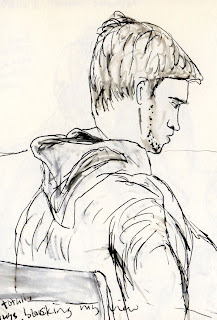 Urban Sketchers’ Manifesto No. 4: We are truthful to the scenes we witness. I think the spirit of this manifesto is that “we draws it like we sees it.” We don’t make a scene prettier or otherwise alter the impression of what’s present to impose our own editorial commentary. My problem is, as much as I want to and try to be truthful to a scene, there’s always too much of the truth available to sketch than I am able to capture. A case in point is this scene at the Ballard Market. 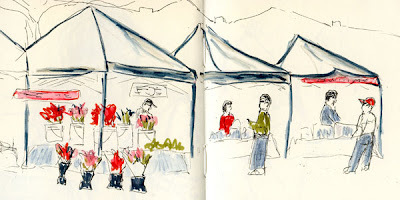 On a sunny Sunday, the market was filled with crowds of people slowly meandering around the flower, food and produce booths, yet I managed to sketch only two individuals (plus a few vendors). I try to follow the advice of urban sketchers who are skillful at filtering out details while leaving the essence of a busy urban scene. 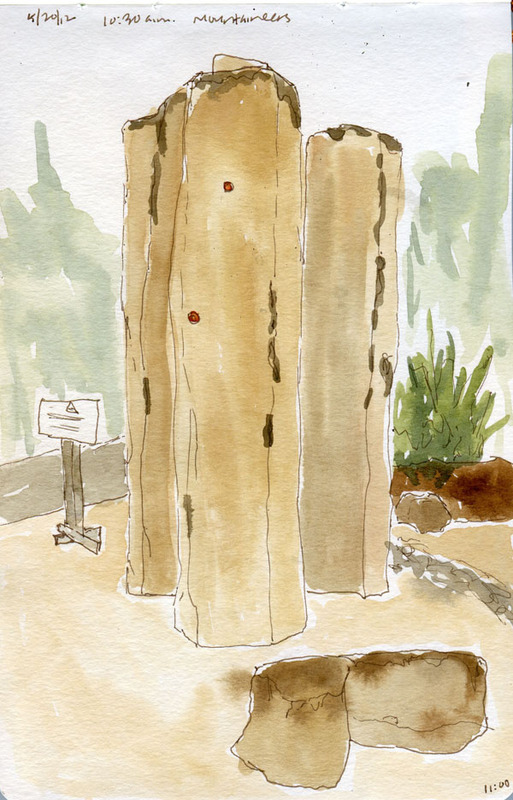 But leaning up against a utility pole with my sketchbook, I was overwhelmed with trying to indicate the crowd without sketching the individuals. So unfortunately, the truth of the market crowd on a beautiful spring day looks more like a rainy winter morning. 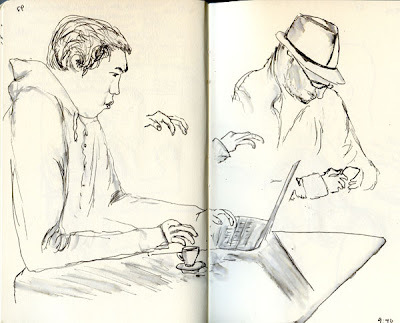 Urban Sketchers’ Manifesto No. 3: Our drawings are a record of time and place. I had only a few minutes before I had to get to the next errand on my to-do list, but it was enough time to stop at a coffee shop with outdoor seating. It was chilly and windy, yet sunny enough to make Seattleites feel hopeful that spring was on its way. 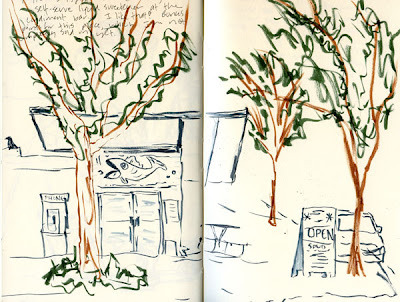 Shivering, I quickly sketched this scene of the fish ‘n’ chips joint across the street, the stiff breeze flipping my sketchbook pages, when a young man startled me by asking, politely, if he could take a photo of me. 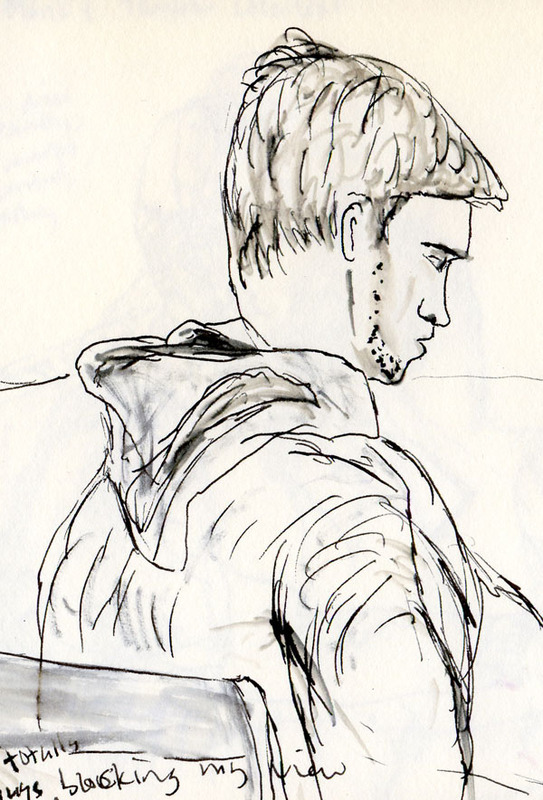 He seemed amazed that I would be sitting outside a coffee shop sketching. 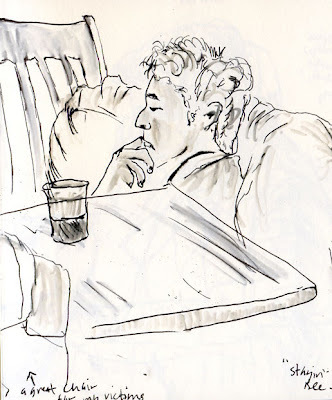 (Because I view the drawings of a lot of urban sketchers, I feel like we are everywhere, yet I suppose we’re still a novelty.) Smiling for his iPhone camera, I thought about how he was making a record of that moment, just as I was. Seeing Gabi’s weekly sketches in The Seattle Times the past few years helped motivate me to start drawing again. His drawings of locations in Seattle – my birthplace and lifelong home town – were sights that I had seen many times, yet had never truly seen. 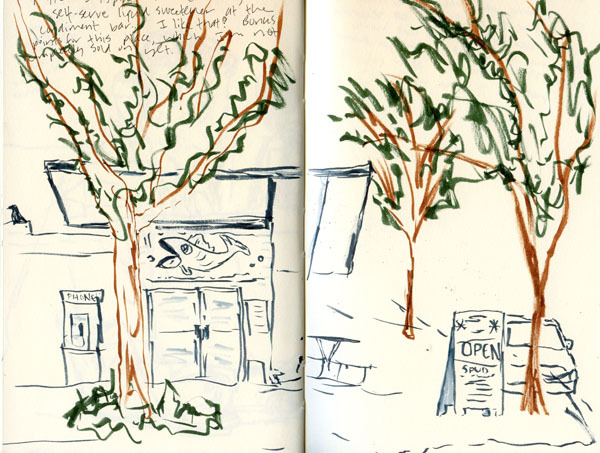 I wanted to learn to see, and therefore experience, those locations (and any new ones that I travel to) more thoroughly, and it was clear to me that sketching them was one of the best ways to do this. With other media I use, such as beads and rope, I occasionally work on small projects while on the go, but for the most part, I stay in my studio. As a writer, even though my laptop makes computing completely portable, I still tend to do my work at home. For that matter, other than travel, all of my personal interests are things I prefer to do at home. I’m basically an introverted homebody. 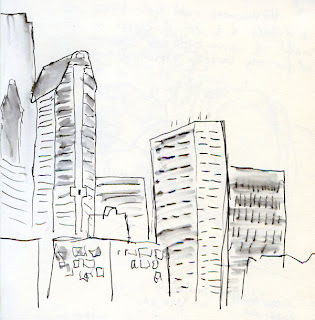 As I learned more about urban sketching, I realized that inherent in our manifesto is getting out in the world – whether that world is only as far as a neighborhood park or on a different continent. Sketching is what takes me out of the house and into the world. The eighth manifesto, to “show the world, one drawing at a time,” has a flip side: Sketching enables me to see the world, one drawing at a time.